I used to commute to Exchange Place in Jersey City via the PATH Train from World Trade Center. On my commute, I noticed a lot of things, but I was also oblivious to a lot of things. For example, there’s a ferry just a few blocks from the station, but it five years and a Hurricane before I finally tried this alternate route between WTC and NJ. It changed my whole perspective. I wanted to create an experience that captures this shift. The entire trip takes place in the shadow of the WTC but does not mention 9/11, instead I chose to spotlight memorials to events that may seem out of place. 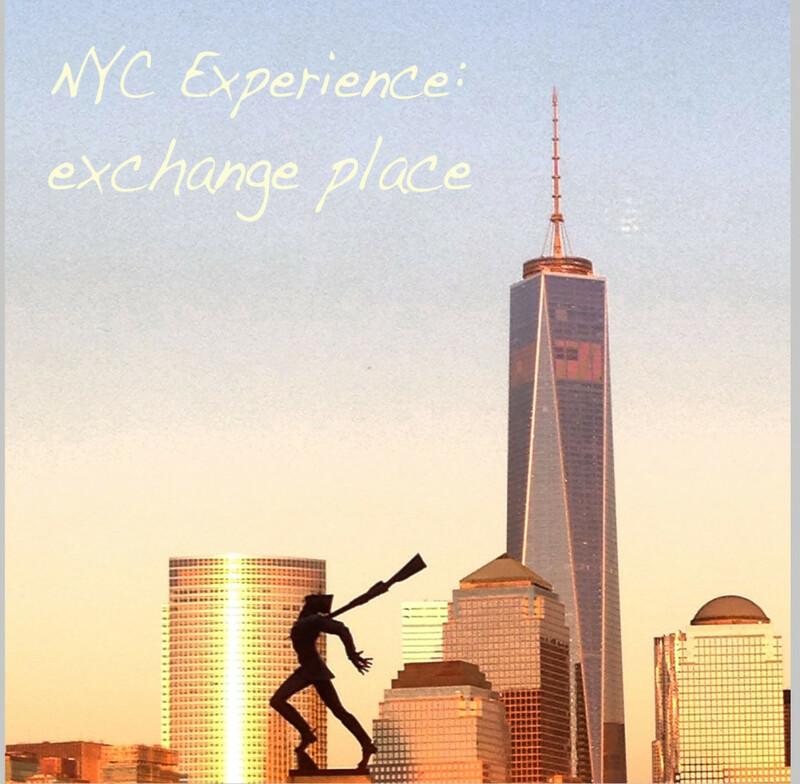 Exchange Place, my NYC Experience Design project, is predominantly an audio tour. 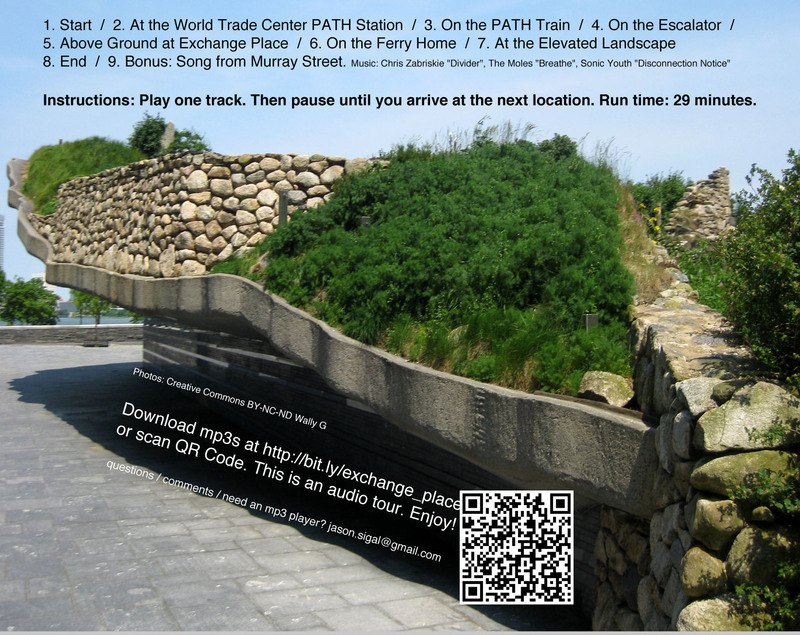 I narrated seven tracks in a voice inspired by the impersonal voices that emanate from the PATH station intercom. At the end of each track, the narrator gives directions to the listener who is asked to pause playback until they reach the next point. I started each track with a sound from the PATH and used background music to provide some continuity, but I worry that I did not provide enough continuity as far as the directions go. I also added two tracks of music to listen to at certain points along the journey. I put my tracks on a CD-R, packaged with photographs of what can be expected on this experience. I also put a sticker on the front of the case to make sure that whoever selected this experience would be able to bring headphones and an mp3 player on their journey. I included mp3s on the cdr and there was also a download link + qr. 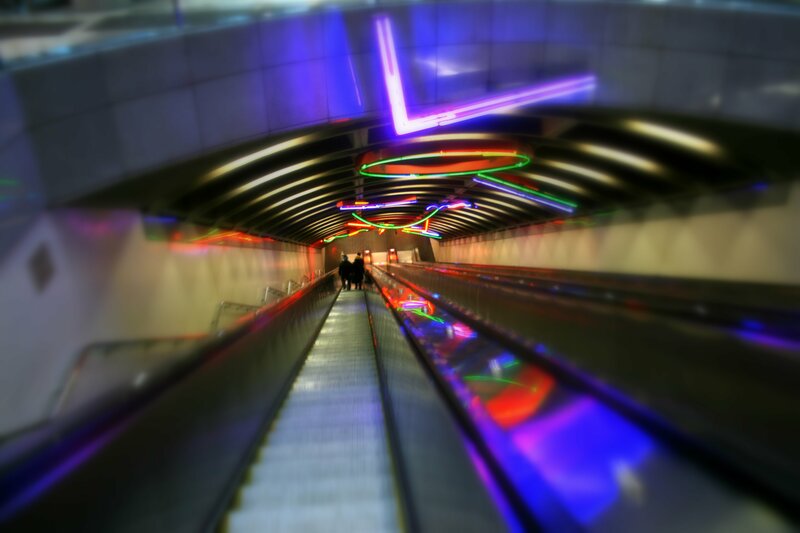 Neons for Exchange Place Station by Stephen Antonakos in 1989. Photo Creative Commons Attribution-ShareAlike Genista via flickr. You can download the audio and take the tour yourself here.